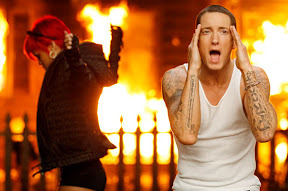 Eminem and Rihanna’s song ‘Love the Way You Lie’ the single that’s been tearing up the top 100 of the singles chart for weeks billboard. The video premiere stars Megan Fox as well as Dominic Monaghan, plays along with the song’s subject of an abusive relationship, as Rihanna and Eminem deliver the lyrics with equal force. Eminem’s “The Way You Lie” song lyrics here.